Let’s be real about the fact that oysters can be intimidating: getting hold of fresh ones, preparing them, shucking them, eating them, dealing with the constantly deferred hope of finding a pearl… No one said life was going to be easy, but oysters are worth it and easier than you think to serve at home. 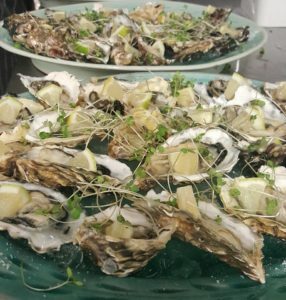 Most of SA’s wild picked oysters are from the East coast (Port Elizabeth, Mosselbay, Knysna) while cultivated oysters are mostly from Saldanha Bay (where they are grown attached to ropes). Oysters are delicious served straight out of the shell with a squeeze of lemon juice and some black pepper or Tabasco sauce.